"Serve up authentic Tex-Mex flavor with our dip of the hat to the famous chimichanga! Start with a creamy base of cream cheese, sour cream and a twist on traditional mayo  tangy McCormick® Mayonesa with Lime. Add shredded chicken, Mexican cheese, Burrito Seasoning Mix and chilies for south of the border taste. 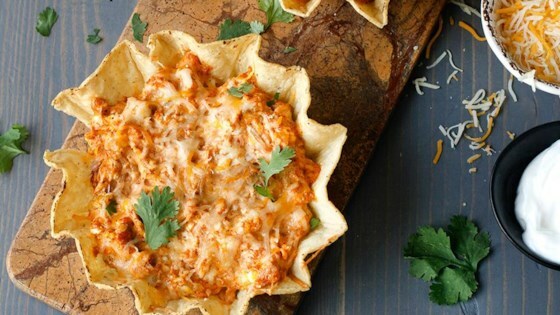 Spoon into tostada bowls, bake and top off with cheese and chopped cilantro. Muy Bueno!" Preheat oven to 350 degrees F. Mix cream cheese, mayonnaise, sour cream, chiles, Seasoning Mix and 1/4 cup of the shredded cheese in large bowl until well blended. Stir in chicken. Place tostada bowls on foil-lined baking sheet. Spoon dip evenly into the 2 tostada bowls. Top each bowl with remaining 1/4 cup shredded cheese. Bake 25 minutes or until heated through. Serve with desired toppings and tortilla chips. Pump up the flavor with this delicious, healthier oven-fried chicken. If unable to find tostada bowls, the dip may be prepared as directed above in an ovenproof baking dish. Serve with assorted toppings, such as sour cream, guacamole, chopped fresh cilantro and sliced jalapeño peppers. Was really good. Made exactly as listed. My husband wished it was a little more spicy but was still impressed. I will def make this again. Just made it for a family party and it was a hit. Easy to make and very tasty. Try it!! !